Harry Underwood is a self-taught painter living in Nashville, Tennessee. He began painting pictures fifteen years ago while working as a flooring installer. He was born during 1969 in Miami, Florida and raised in the rural 'Redlands' farming area near Homestead. His father was a carpenter and his mother worked at a supermarket. He has one sister. With his family, he attended the Church of God pentecostal church until 1982. As a teenager, he cleaned swimming pools at many of the motels in the area and bussed tables at the Capri Italian Restaurant in Florida City. Uprooted by Hurricane Andrew in 1992, he lived in New Orleans and Austin, eventually settling in Nashville where he worked in the construction industry until 2005. His artwork has been shown by galleries in United States, France and England. 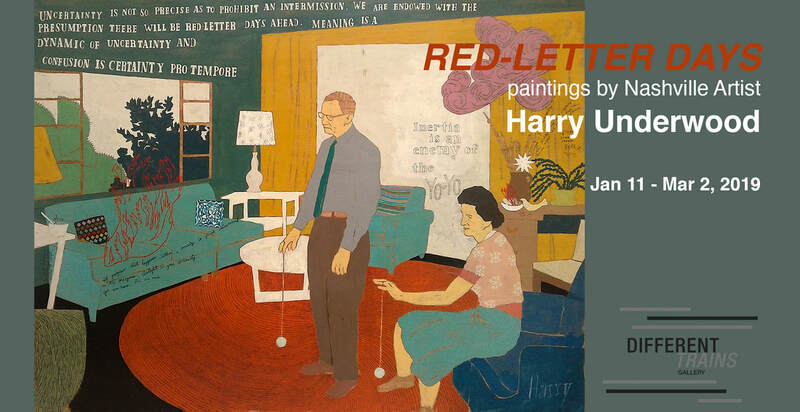 His Georgia debut exhibition, entitled "Red-Letter Days" opens January 11, 2019 and continues through March 9. Harry Underwood, "When You Wish Upon a Star"
Harry Underwood, "Hold the Bottle"
Harry Underwood, "Determined to Splash"